The upper section interior framework of the station will consist of angle runners for blade trays and a drawer to hold 1 off blade tray. The lower section will have a pull out frame on ball bearing slides to load discs onto for storage, next to this will be 2 off pull out shelves with locating holes to receive Erowa pins. All drawer and shelves will pull out to 100 % extension to allow full access to parts. The main work area will have a 40mm deep removable tray and fixing points for the Loading Tower. A bracket to hold the Erowa chucks will be fitted to the left side of the work area. 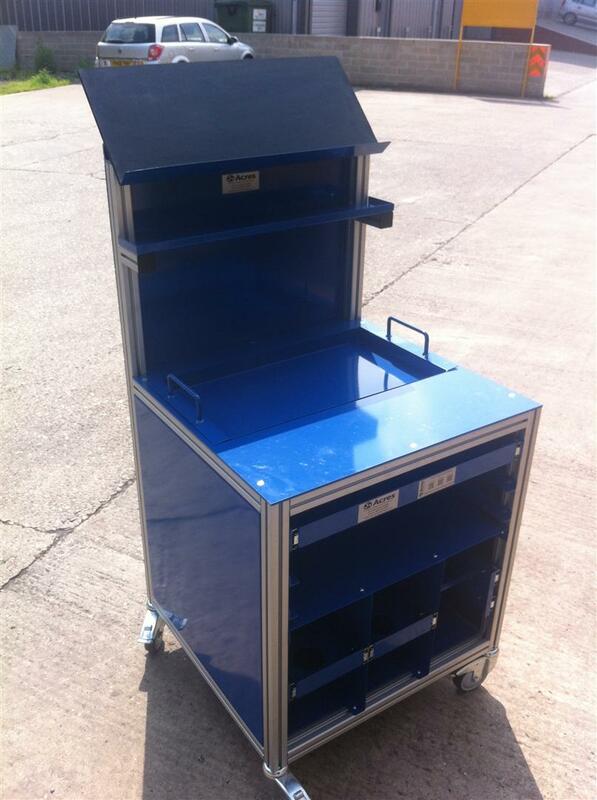 The rear up stand will be manufactured from mild steel and powder coated to give a hard wearing durable finish and feature and incline with a 30mm front upturned edge to prevent parts falling off. A shelf fitted to the up stand will carry the Tech pack. Both main work areas and incline section will be covered in 3mm rubber. Approximate overall size 690mm (W) x 690mm (D) x 1570mm(H) Table top height 840mm.